I went to Shanghai and Hangzhou on a 5 days 4 nights trip (15th September to 20th September 2013) with my ex-classmates of over 2 decades and sister in tow. It was an idea manifested during our Chinese New Year gathering. 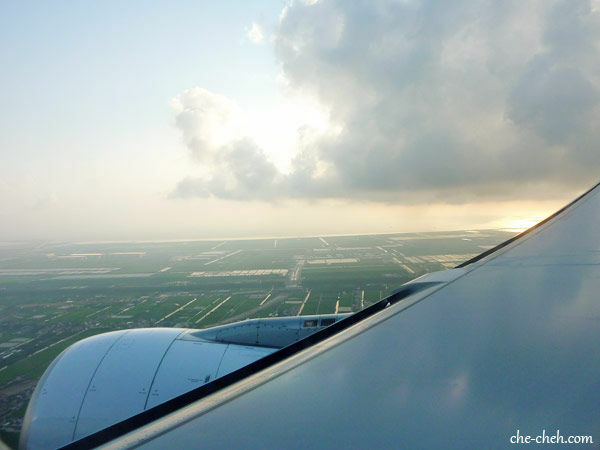 The first time I traveled oversea with friends was 7 years ago to Bangkok. The Bangkok trip were quite enjoyable so I thought this one would be alright too except it wasn’t for my case. I didn’t enjoyed much. Either because Shanghai has not much to offer or because of the company. Ever since my horrible experience with Airasia I’m not really fond of traveling with them again unless I have to. And this time I don’t have to. We managed to secure some really cheap seats from MAS. MAS Shanghai return ticket only cost RM1001/pax. Airasia’s Shanghai return is either only cheaper or expensive by few ringgits. So of course we choose MAS. For this trip, I didn’t bring my DSLR which I think is kinda clever of me. LOL All the photos taking were done by my sis’ Lumix and my Samsung S3. For Malaysians, you will need visa to visit China and you have 2 options when applying for the visa. 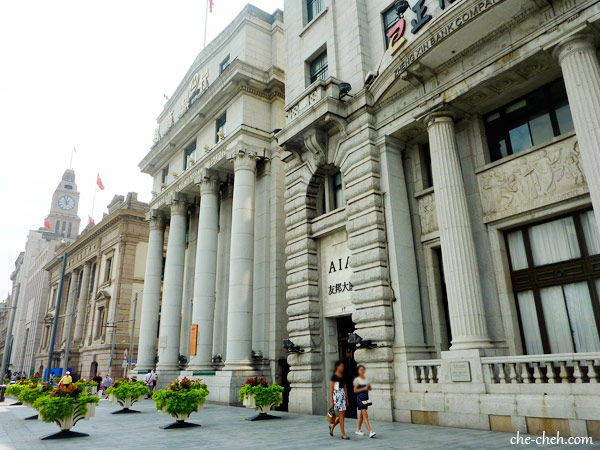 Either you go to the Chinese Embassy yourself or apply through travel agent. We apply our visas through travel agents as it’s more convenient. I thought I was smart by choosing the plane schedule that depart at 1.40am and reach Shanghai at 7.00am (5 hours 20 mins). Seems like a good move right? 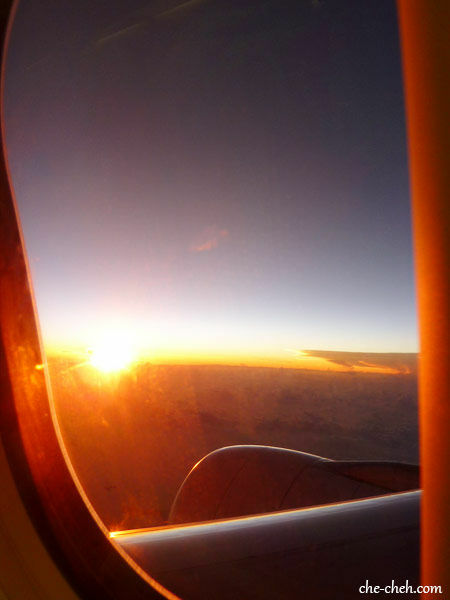 Sleep in the plane and then touch down and we can have a whole day there. WRONG! 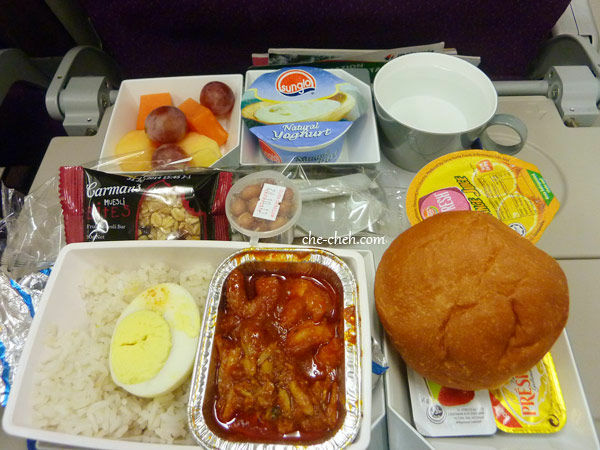 I forgot refreshment and meal are served in the plane hence not much sleeping is done. In fact some of us only slept for 1 to 2 hours in the plane. LOL Another lesson learned! Breakfast was served at 4.50am. I was just falling asleep. This is chicken with dry noodles. Quite yummy. My sis’ nasi lemak. She said it’s very delicious. 6.40am. We’re breathing Shanghai’s air! We arrived at Pudong Airport right on the dot. We have a friend living in Shanghai with her husband (another reason why we are visiting Shanghai) and because we need to pass something to her, her husband came to the airport. 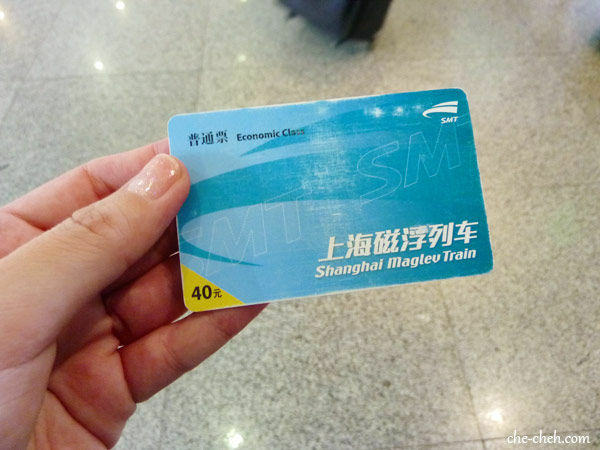 We decided to try Shanghai Maglev Train which cost 50 Yuan one way economy. 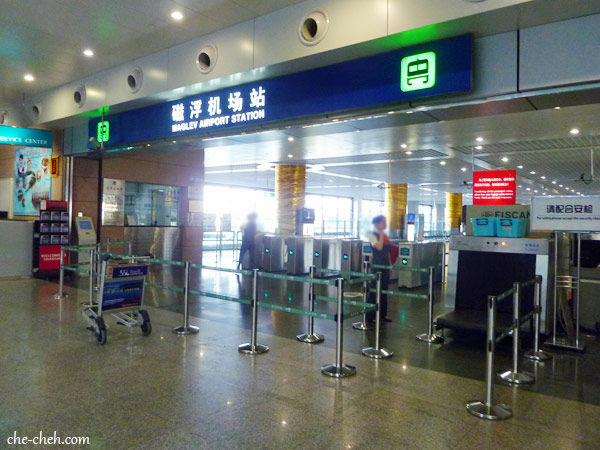 If you show your boarding pass (which we did), you only pay 40 Yuan. 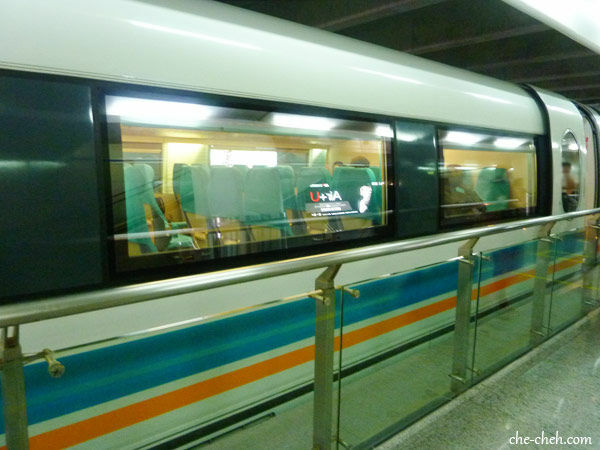 Maglev train is special because it uses magnets to propel the train. 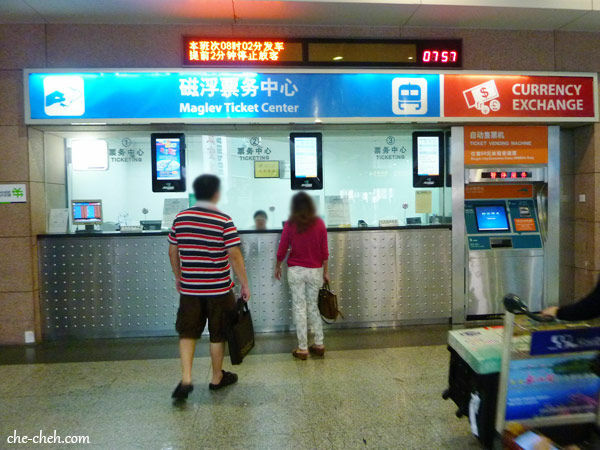 Maglev Airport Station. This is where we went through and had our baggage scanned. 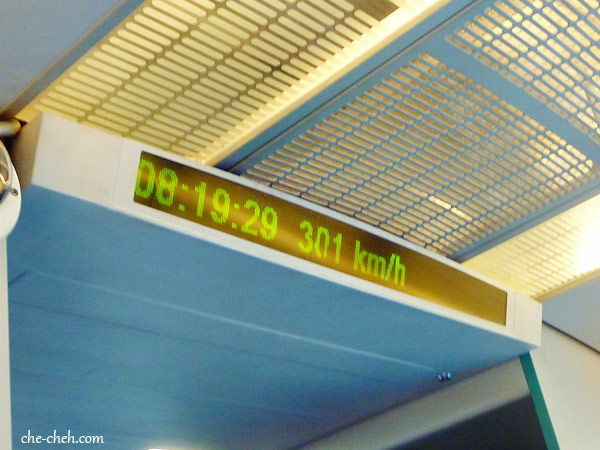 Maglev train reaching 301km/h. I thought it would be cool to ride on the Maglev. Well, it feels just like any other trains. The speed when it reached the highest is like normal train speed. LOL Nothing special. So I guess once is enough. The Maglev Train final destination is at Longyang Road to which we took a metro from there to East Nanjing Road for 4 Yuan. It was quite a long walk to our accommodation (Fish Inn Bund) because we were dragging our baggage so it seems like forever! Been there done that but my precious ex-classmates had not. We were lucky as our rooms were ready and therefore were able to check-in to our rooms as early as 10am+. Thank you so much!!! You don’t know how tired we were. I’ll write about our hotel in the later post. After some rest, we head out for lunch. 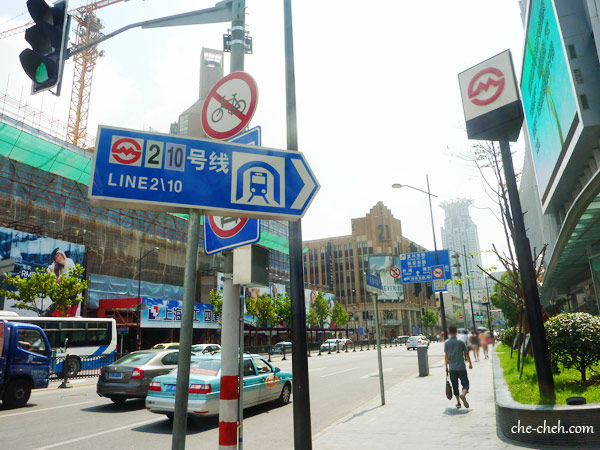 East Nanjing Road Metro which is about 5 minutes walk to our hotel. 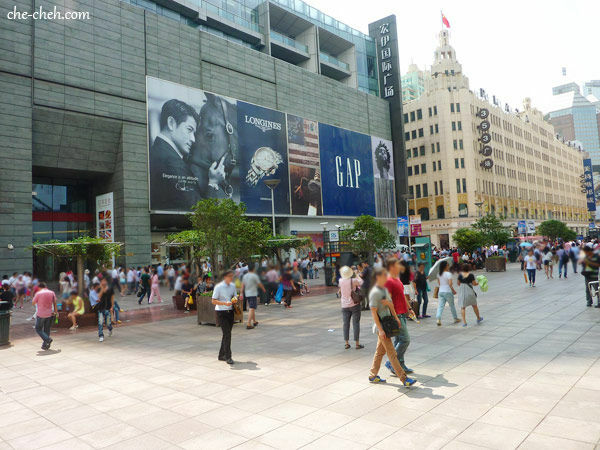 This is the famous shopping road called Nanjing Road and yes that’s Kwok Fu Sing in the billboard. This road is pedestrian only. Our lunch at 11.40am is at McDonald’s. Ohmygod the place is packed and so hot. This burger is yin and yang. 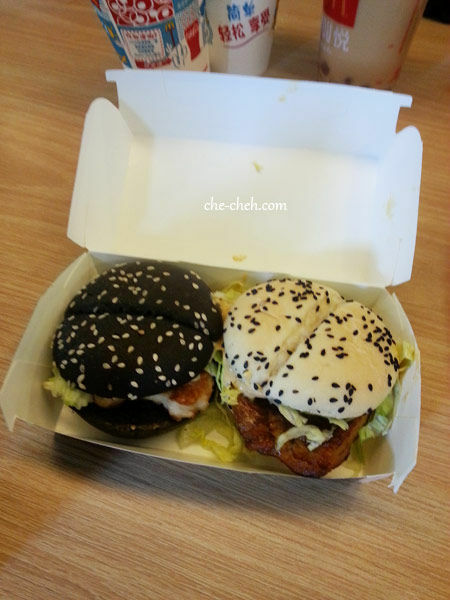 One is pork burger and the other is chicken burger. I ate the delicious pork burger (with charcoal bun I think). My friend said the chicken burger is yummy too. The menu are all in Chinese so thank God we have a friend who knows how to read Chinese. If I’m just alone with my sis, I’ll just point to what I want. LOL By this time, we were all so TIRED. 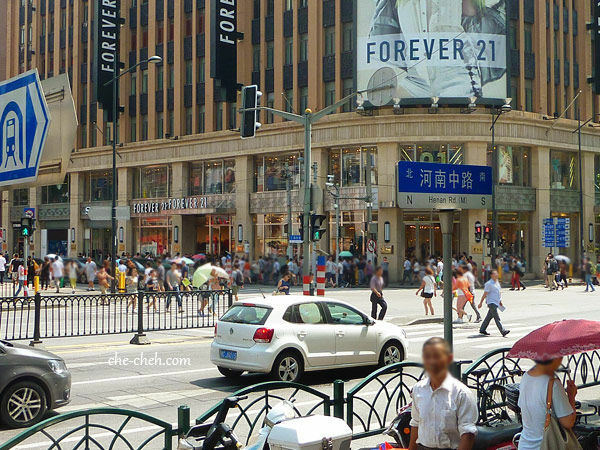 We hop into Forever 21 for a little while before walking to the Bund at mid afternoon. 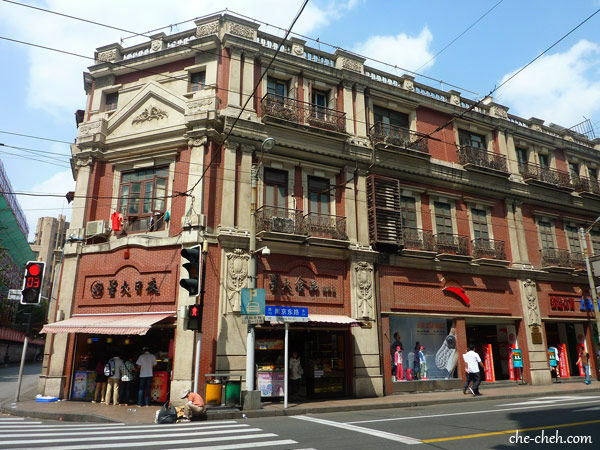 A food shop at Nanjing Road. 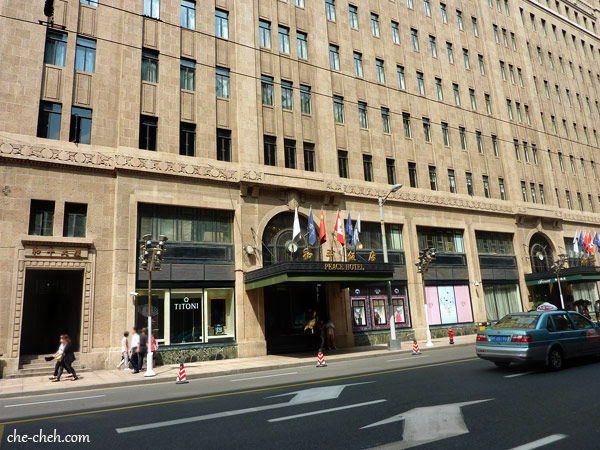 Passing by the famous Peace Hotel, Shanghai. 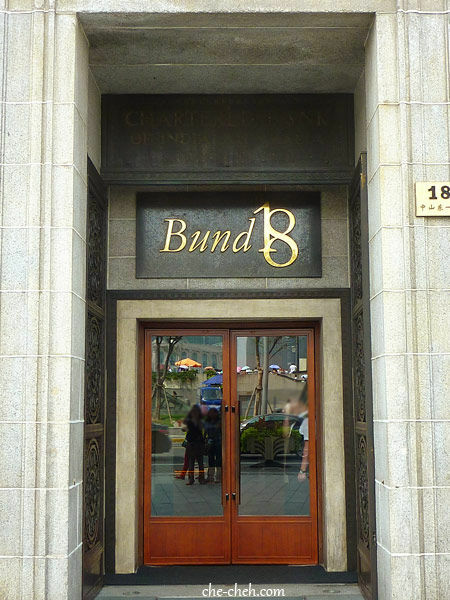 Bund 18. Nice name right? I love the signage. The Bund, Shanghai, China. One row of very old and beautiful buildings. Cool! 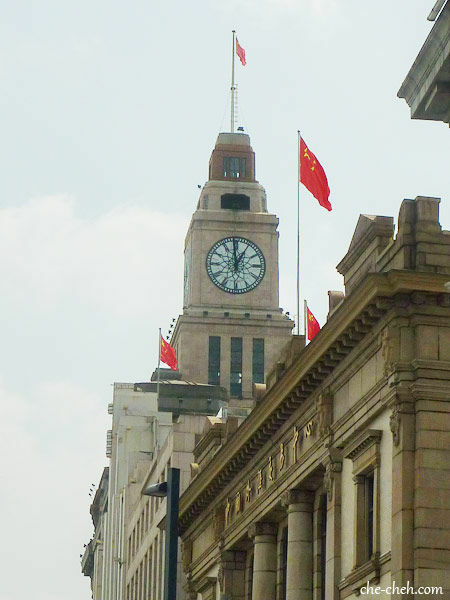 The lovely clock tower of Custom House at The Bund, Shanghai, China. It rings every 15 minutes if I’m not mistaken. 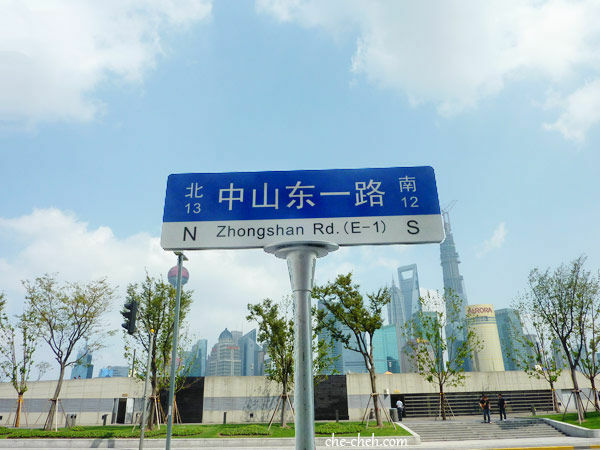 Zhongshan Road where The Bund is located. 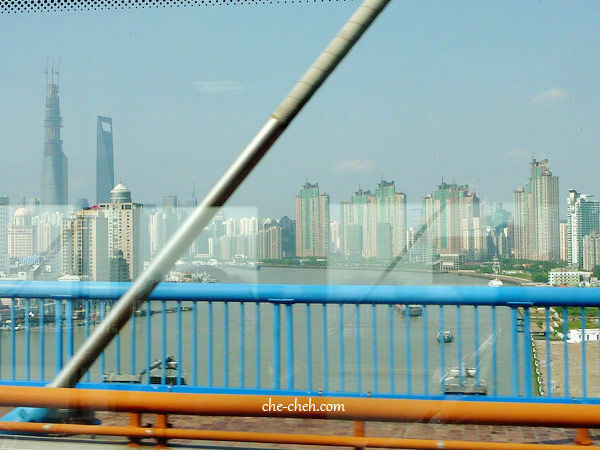 In front is the Pudong skyline separated by Huangpu River. The awesome Pudong skyline and landmarks. So beautiful right? On the right most can you see a skyscraper under construction? Known as Shanghai Tower it’s currently the tallest building in China and second tallest in the world. Beside it is the former tallest building in China called Shanghai World Financial Tower which looks like a corkscrew (built by Japanese… ahem that’s why the Chinese wanted another tower to surpass it and call it their own). And on the left most the building that look so futuristic is the Oriental Pearl Tower. 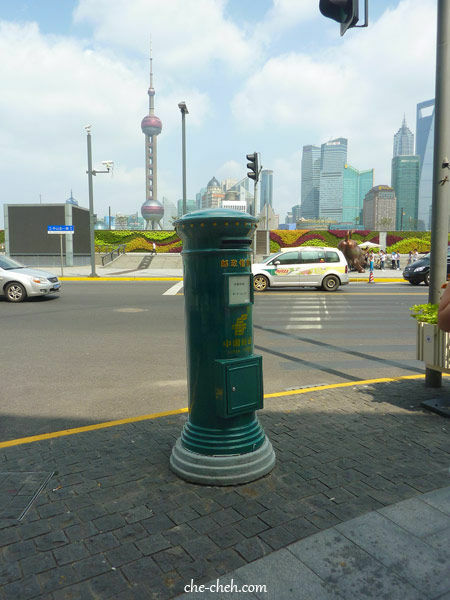 Saw a post box at The Bund and my hand is itchy. But where’s the post office? 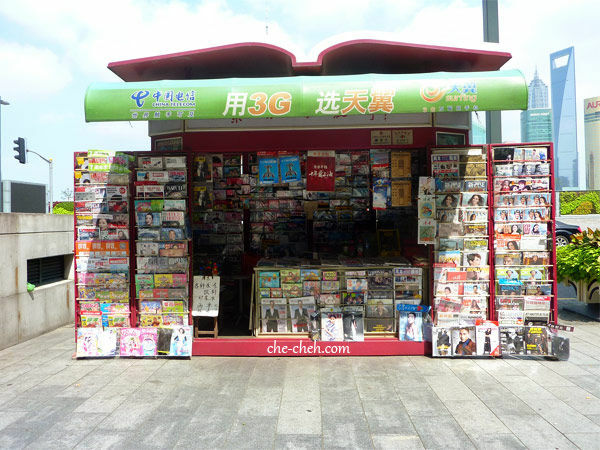 Magazine shop at The Bund. After 2 hours of walking we all gave up! We’ve become walking ZOMBIES. LOL So we decided to hail the City Sightseeing bus and go around Shanghai following the yellow line. It’s 30 Yuan for 24 hours. 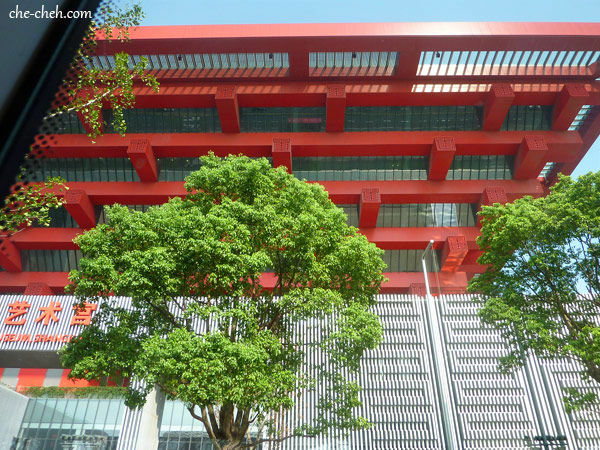 One of the stop is at China Art Museum Shanghai, where World Expo 2010 Shanghai was held here. My dad came for the expo during that time. 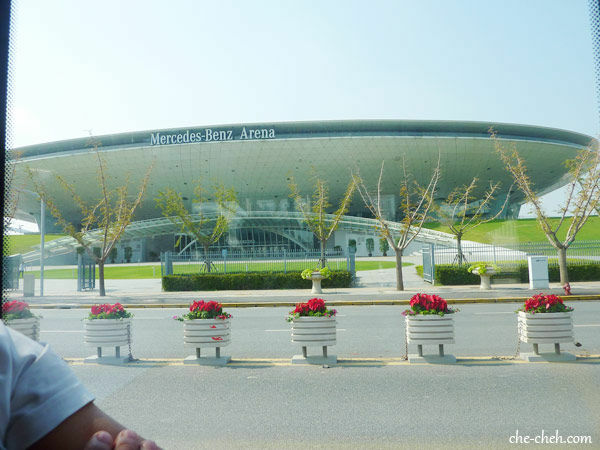 Mercedes-Benz Arena which I found out later is the opening ceremony location for Expo 2010 Shanghai China. Love this building. We got off from the bus at Peace Hotel and walked back to hotel after that. For dinner, we have a meet up with our friend, her husband and baby son at a restaurant called How Way Restaurant which served mostly Szechuan dishes. As I couldn’t take any spicy dishes, they kindly order other dishes for me. Thanks Q and E! I didn’t take any photos as I was dead tired (just go with the flow baby!) but my friend did. Unless I get the photos from them, I won’t blog about it. The food are delicious by the way and my favorite is the roasted duck dish. We took 2 taxis to and fro the restaurant as there are 5 of us and on the way back, we had a scary encounter with the taxi driver. He was asking all sort of questions like when are we leaving Shanghai, what time are we leaving, blah blah blah. Turns out he wanted to fetch us to airport but still all of us got scared lo. Besides the taxi is very shady and smelly. Yuck. Oh you didn’t really enjoy your Shanghai trip? Sometimes I prefer to travel alone rather than follow friends who do not have the same interests with me. A big part of me not enjoying myself is because of the place itself I think. I actually swore off visiting China after my Beijing trip. Thought of giving Shanghai a chance since I’ve never seen The Bund before. I find Shanghai ‘cold’. Maybe because I indulged mostly in fast food joints and not getting know the local culture through their foods. More funny story to come. LOL. Oh why you did not bring your DSLR? Anyway, I hate bringing around bulky DSLR, so I always never bother to get one, and always stick to my Lumix LOL! Oh yeah, sometimes MAS offer better prices than AirAsia. And if it’s only slightly pricier, then better take MAS right? 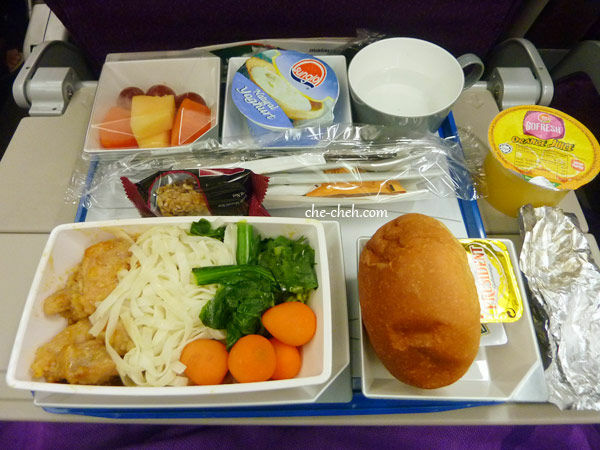 The meals are so much more delicious than what AirAsia offers LOL! Oh yeah and also the comfort of the seat and service are much better. Oh so the Maglev train is nothing special? I thought it can go very fast? It’s fast but I didn’t feel the ‘fast speed’. It’s like riding on Trenitalia (European trains). It was yummy. I actually dislike eating fast food when I travel. Trying out their local foods is a way of getting to know their culture. Wow! Your photo of the Pudong skyline with those skyscrapers look like a piece of art! I find the buildings there quite interesting! Wow! Didn’t sleep for 18 hours? No wonder you are like a walking zombie haha! I agree when going to a foreign country, eating the local food is the best way to get to the place and people. My mom and I do not speak mandarin, so it was a lot of chicken and duck communication when we were in China. Hahaha I like your sense of humor. I find The Bund too modern for my liking. 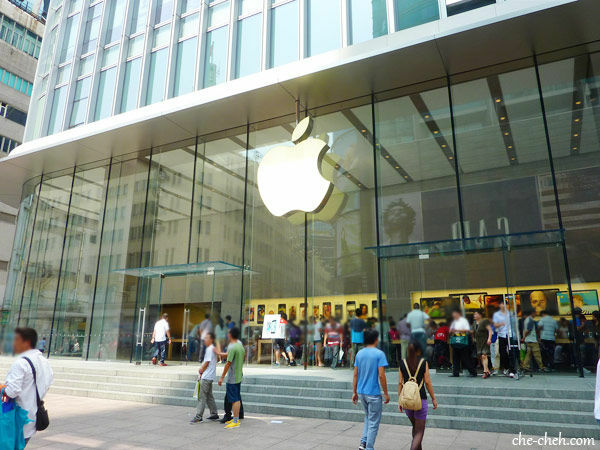 It’s like the place is being monopolized by ang-mohs (international brand names). 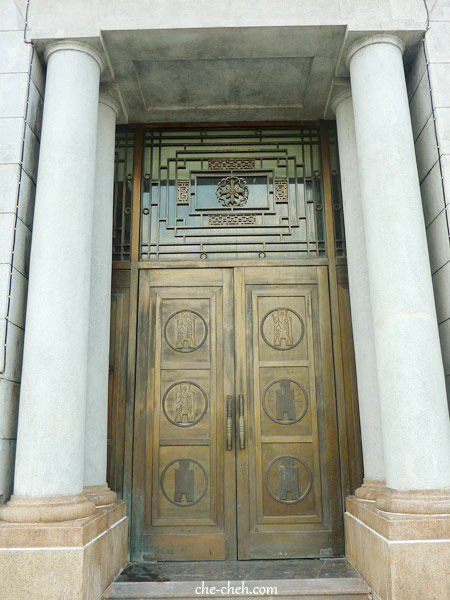 Of course there are some Chinese offices/banks there as well. I want the Chow Yuen Fatt’s Bund. LOL Still I love those colonial buildings like you. I love chicken and duck talk. At least you get satisfaction from the outcome right? Either they finally understand you or NOT. Kekeke Food is the key to people’s heart. When you try the local food, at least you know what it feels like to be like them, eat what they eat. hi may i know how long it took from pu dong airport to the fish inn hotel? Hi Roxane, if you travel by Maglev train from airport to LongYang Road it’ll take about 8 mins, then from LongYang Road metro to East Nanjing metro is 17 mins. Include walking to Fish Inn less than 10 mins… in total it’ll take about 35 minutes. Of course this doesn’t include walking to the Maglev terminal and waiting for the metro time. So give about 1 hour to yourself from Pudong airport to Fish Inn.